Spanish sailors in search of a northwest passage were the first Europeans to see what is known today as Oregon. Settlers traveling in wagon trains over the Oregon Trail in the 1840s followed the missionaries who had come in the 1830s. 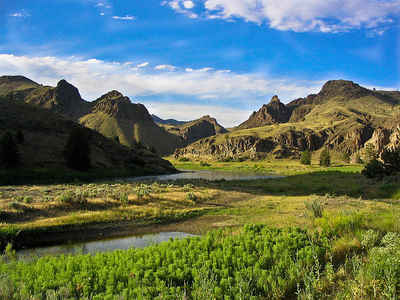 Oregon was admitted as the 33rd state on February 14, 1859. Oregon is a state of great natural beauty with places such as Crater Lake National Park and the Columbia River Gorge. Its mountains, covered in forests, make Oregon the leading state in the production of wood products. The state flower of Oregon is the Oregon grape, and the capital is Salem. The origin of the state's name is unknown, but one theory holds that it may have come from the Wisconsin River, shown in a 1715 French map as "Ouaricon-sint."